Secretary of State Hillary Clinton answers questions about what she knew about the September 11 attack on the U.S. diplomatic compound in Benghazi, Libya, and when she knew it. Earlier today, Clinton testified before the Senate Foreign Relations Committee on the same subject. [Updated at 5:03 p.m. ET] And after three hours, the session is over. The panel's chairman, Rep. Edward Royce, R-California, ends the session by saying he's concerned whether the independent review board captured fully what happened in Benghazi. [Updated at 4:59 p.m. ET] The last question goes to Rep. Grace Meng, D-New York. Noting French and military action in Mali, she asks what more can the United States ask of "allies in the area" to combat problems in Africa. Clinton says U.S. military trainers have been working with multiple African forces to get them in a position to successfully combat Islamist militants. She notes that the United States just recently recognized the new Somali government, saying that wouldn't have been possible without U.S. and U.N. support. Clinton says: Nobody can match the United States in military assets and prowess, but the United States' challenges are not immediately solved by military action alone, so the country needs to get countries in Africa to boost their own anti-terrorism efforts. [Updated at 4:56 p.m. ET] Rep. Alan Lowenthal, D-California, asks Clinton how officials should go about making the analysis between diplomatic presence and risk. Clinton says: "This is my ongoing hope, that we can get it more right than wrong." "I don't think we can retreat from these places," she says. "We've got to be there, picking up intelligence." [Updated at 4:52 p.m. ET] Rep. Tom Cotton, R-Arkansas, asks Clinton whether she's distressed over Tunisia's decision to release a suspect in the Benghazi attack. Clinton says no. That's because high-ranking Tunisian officials told her that they released the suspect because they're committed to the rule of law and that they didn't yet have sufficient evidence against him, she says. The Tunisian officials promised that the suspect would be watched carefully, Clinton says. [Updated at 4:45 p.m. ET] Rep. Mo Brooks, R-Alabama, addresses what U.N. Ambassador Susan Rice told the media shortly after the attack. Brooks asks: Were her comments about the attack being a spontaneous reaction true or false? Clinton points to the independent post-Benghazi review board's conclusion. "There is still question about what caused it," Clinton says. But: "That is not the weight of the evidence right now," Clinton says. Brooks asks: Was Rice's statement about the Benghazi attack being a copycat of the September 11 demonstration outside the U.S. Embassy in Cairo accurate? "It turned out not to be," Clinton responds. She notes there were differences, specifically that demonstrators outside the Cairo embassy weren't heavily armed. Clinton defends Rice, saying that Rice was working with the information that she had been given. - He says Clinton, in a briefing shortly after the attack, told lawmakers that the Benghazi attack was related to an anti-Islam video made in the United States. - He says that because a (unarmed) U.S. drone was flying overhead, he assumes that Clinton would have had a live video feed, showing her what was happening at the Benghazi compound. - He says that U.S. F-16s from an airbase in Italy, even if unarmed, could have flown to the area to do nonviolent things to disperse crowds. Clinton responds that she didn't tell lawmakers that the Benghazi attack was related to the anti-Islam video. She says she told them that other demonstrations around that time in other countries were related to demonstrations against the video. She also says she personally did not have live video of the area. [Updated at 4:29 p.m. ET] Rep. Bradley Schneider, D-Illinois, asks how the State Department will weigh security risks against its desire to help other countries. "It is a constant debate, congressman," Clinton responds. "It is something we take very seriously when we do it." Schneider asks: How do we ensure we're able to provide resources to high-risk posts? "Very difficult," Clinton responds. "We have to ask you, based on our best assessments, what we need to do our jobs." [Updated at 4:25 p.m. ET] Rep. Jeff Duncan, R-South Carolina, rips into Clinton. He refers to, among other things, a June 7 request for more security at Benghazi that was rejected. “You let the consulate become a death trap, and that’s national security malpractice" Duncan said. Duncan questions whether Clinton truly is taking responsibility for the attack, because she's still the secretary of state. What, Duncan asks, does responsibility mean to Clinton? "I think I've made that very clear, congressman," Clinton responds, a bit testily. She notes that she didn't have to release a declassified version of the independent post-Benghazi review board's report. "The reason we have ... review boards is we take out politics, we take out emotions ... and we try to get to the truth," Clinton says. [Updated at 4:13 p.m. ET] Rep. Tom Marino, R- Pennsylvania, talks about a pre-Benghazi Department of Defense report of al Qaeda-affiliated or -sympathizing protesters who were seen holding certain black flags outside U.S. diplomatic compounds in North Africa and the Middle East. He asks why security wasn't therefore properly boosted at diplomatic compounds such as the one in Benghazi. "I personally think it would demand an increase in security,” Marino says. Clinton responds that she was well aware of people claiming to be associated with al Qaeda that were attempting to influence militias and exercise more authority. Marino then asks why the State Department officials who were put on leave because of the attack are still being paid. Clinton - somewhat exasperatedly, because she addressed this earlier during the hearing - responds that certain laws and regulations stipulate that they have to be paid, and that these rules stand in the way of their firings. Earlier during this hearing, Clinton said she's asked Congress to fix these rules so that such firings can happen. [Updated at 4:03 p.m. ET] Rep. Matt Salmon, R-Arizona, asks: Given that Clinton says that security requests before the Benghazi attack never got above the assistant secretary level, is Clinton concerned about the flow of information within her department? Clinton responds: The independent post-Benghazi review board found that Ambassador Stevens "did not (forsee) an attack of this scale," and that the intelligence community didn't make a connection between the "threat environment" and a direct threat on the Benghazi compound. Clinton says her department is acting to implement recommendations made by the review board. [Updated at 3:57 p.m. ET] In response to questions from Rep. David Cicilline, D-Rhode Island, Clinton says she is "for the first time elevating a lot of these security issues to the secretary level." [Updated at 3:52 p.m. ET] Rep. Ted Poe, R-Texas, asks whether any suspect in the Benghazi attack is currently in custody. "One suspect is under monitoring by the Tunisian government," Clinton says, adding that the FBI is monitoring other suspects. She says the FBI's director went to Libya and Tunisia, and that he believes the investigation is proceeding. She notes that the FBI has given lawmakers classified briefings regarding suspects. "I certainly hope that the FBI is able to investigate and identify those responsible," she says. [Updated at 3:48 p.m. ET] Rep. William Keating, D-Massachusetts, asks Clinton about the pressures of cost-cutting at the State Department. "One never knows what the budget is going to be going forward," Clinton says. "We've had some ups and downs budgetary-wise." [Updated at 3:44 p.m. ET] Rep. Michael McCaul, R-Texas, refers to an Aug. 16 cable that warned that the Benghazi compound couldn't withstand a coordinated attack. He asks whether Clinton was aware of the cable. "That cable did not come to my attention," Clinton says. "I made it very clear the security cables did not come to my attention or above the assistant secretary level where the (independent post-Benghazi review board) placed responsibility." McCaul asks when Clinton was aware of the cable. Clinton says she knew of it only after the review board began its investigation. McCaul asks whether the cable was a surprise to Clinton. "It was very disappointing to me that the (review board) concluded there were inadequacies and problems in the responsiveness of our team here in Washington to the security requests that were made by our team in Libya," Clinton says. "I was not aware of that going on ... but it's something we are fixing ... to make sure it doesn't happen again." [Updated at 3:34 p.m. ET] Rep. Joe Wilson, R-South Carolina, asks Clinton whey U.N. Ambassador Rice went on the Sunday news talk shows to address the Benghazi incident instead of Clinton. Clinton says "I have to confess ... that going on Sunday shows isn't one of my favorite things to do," that she hadn't been on such shows more than a year, and that she believed that her time was better spent helping to manage the United States' response to the attacks. [Updated at 3:26 p.m. ET] Rep. Theodore Deutch, D-Florida, asks: "What kind of strain will the presence of less military personnel in the region" put on diplomatic security. "When our troops withdrew from Iraq, it dramatically altered what our civilians were capable of doing," Clinton says. "We're going to face the same kind of questions in Afghanistan." [Updated at 3:21 p.m. ET] A light moment from Rep. Steve Chabot, R-Ohio, who jokes that he looks forward to most of the departing secretary’s future endeavors. Presumably the Republican wouldn’t be a supporter of any 2016 Clinton presidential run. Chabot takes the rest of his allotted five minutes to make statements. He says lawmakers have had to jump through hoops to get information about the attack. He says the House committee got was a "document dump" that made it difficult to find useful information. "More than four months later its unacceptable that the State Department has made it so difficult" for congressional oversight, he says. Because Chabot used up his time, Clinton will have to respond in writing. We’re on to the next congressman. [Updated at 3:17 p.m. ET] Rep. Gregory Meeks, D-New York, asserts that Congress "has failed to act in a meaningful way" regarding money for security issues. Meeks wants to know what the United States can do to move forward with nations whose governments turned over in the Arab Spring - such as Libya - to prevent these types of attacks from happening. Clinton says: "We cannot retreat from, give up on these new Arab Spring revolutionary countries and new regimes. They are very new. Most of them have leaders who have never run anything. They have come from backgrounds where they are suspicious of security." "We have to do some work. That work requires we stay engaged," she says. "We need to do a better job conveying a counter-narrative to the extremist jihad narrative." Clinton says she said the very next day that it was a terror attack. But she says there still are questions about what promoted the attack and who the attackers were. 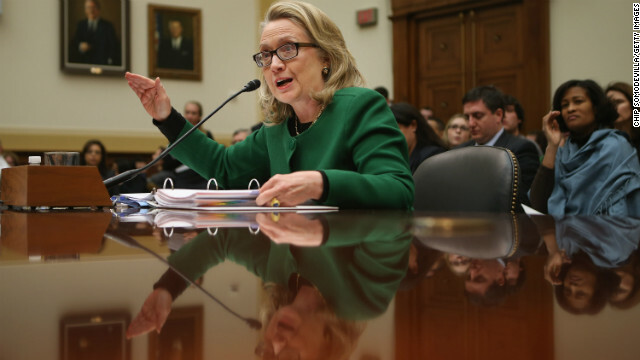 The independent post-Benghazi review board said the issue was complicated, Clinton says. She then makes a reference to the review board's unclassified report and its classified report. Rohrabacher goes no further after that remark. [Updated at 3:07 p.m. ET] Rep. Brad Sherman, D-California, asks whether the Libyan government has the will and capacity to arrest those responsible for the Benghazi attacks. Clinton responds that "I've found Libyan officials to be willing, but without capacity." Clinton says the United States needs to give Libya money to upgrade its own security capabilities. It has its own problems, and its own leaders are being attacked, she said. Clinton notes that the United States government has placed holds on funds that would help Libya with its security capacity. Although Libya may have oil resources, until the post-Gadhafi government can "get up and going," it's in the United State's interest to give Libya resources, she said. [Updated at 3 p.m. ET] Now comes Rep. Christopher Smith, R-New Jersey. He says America is relearning the same lessons that came after similar situations, and tells the subcommittee that the lessons were shockingly similar. He refers to 1998 attacks on embassies in Kenya and Tanzania. Smith acknowledges Clinton takes responsibility for "during and after" the Benghazi attacks. He asks: What about before? He's referring to Stevens' cable, shortly before the attack, saying more security would be useful. When did Clinton become aware of Stevens' request for security upgrades, and what did she do in response, Smith asks. Clinton says no cables requesting more security came to her attention. [Updated at 2:57 p.m. ET] Eni F.H. Faleomavaega, D-American Samoa, apparently is going to be a more friendly questioner. He says he's looking forward to 2016 - a nod to the possibility that the departing secretary of state could run for president in four years. Faleomavaega talks about the unfailing dedication of Ambassador Stevens and others. He wants Clinton to clarify what she meant when she said that Stevens went to Benghazi knowing how bad it was. "We have a foreign service that is composed of men and women who take on these responsibilities because they love their countries," Clinton says. "Chris Stevens was one of our very best." "In the wake of this tragedy, I think one of the most poignant events has been overlooked. That is what happened after the Libyan people ... learned that Chris Stevens, someone who they had gotten to know, was murdered." Clinton was referring to Libyan street demonstrators who protested against the attacks that killed Stevens and the three other Americans. [Updated at 2:50 p.m. ET] Next up is Rep. Ileana Ros-Lehtinen, R-Florida. She asks why the post-Benghazi review board didn't interview Clinton. "I think that's outrageous," Ros-Lehtinen says of the board not having interviewed Clinton. Ros-Lehtinen also asserts that while some officials might have been reassigned after the attack, no one at the State Department has been sufficiently punished. She asked whether Clinton finds it acceptable that officials who "ignored security requests" remain employed by the State Department. Clinton responds that the review board was focused on security issues, and that therefore the board interviewed security experts. "If they thought that I was relevant, I would have gladly" spoken to the review board, Clinton said. Regarding the certain State Department employees who technically remain employed, she points out that they have been removed from their former positions and placed on administrative leave. She asserted that they remain employed because of restrictions in law. The review board, she said, didn't find that their actions didn't legally rise to the level of breach of duty. Clinton says she's asked Congress to fix certain laws and regulations so that such firings could happen. [Updated at 2:41 p.m. ET] Rep. Eliot Engel, D-New York, asks about the department's requests for security finding from Congress. He wants to know if Congress provided proper resources. "Since 2007 the department has consistently requested greater funding," she said. "With the exception of 2010, Congress has enacted less than requested." Clinton said that the post-Benghazi review board that she appointed has said that more resources are needed. "The funds provided by Congress were inadequate," she said. [Updated at 2:38 p.m. ET] Royce asks Clinton why a Defense Department "site security team" had been withdrawn from the area in August. Clinton responds that the team is focused mainly on the embassy in Tripoli, Libya, and not the Benghazi site. Less than 2 percent of its time was ever spent in Benghazi, she said. "They helped to stand up embassy in Tripoli when (it) reopened. At the end of the day, they were not focused on Benghazi," she said. [Updated at 2:31 p.m. ET] Rep. Edward Royce, the California Republican and chairman of this panel, prefaces his questions by asserting that the State Department "saw this (Benghazi) risk coming," but "didn't act to prevent what could have been handled by answering" requests by certain personnel for more security. Royce asserts that senior officials knew U.S. diplomats weren't safe, and he says he wants to know why, therefore, was security withdrawn. Royce acknowledges that Clinton, this morning, told the Senate panel that she hadn't personally seen any request for more security. [Updated at 2:28 p.m. ET] Clinton has concluded her opening remarks, and she's ready to take questions. [Updated at 2:27 p.m. ET] Clinton, still delivering her opening statement, is now asserting there's a growing issue of al Qaeda's influence in North Africa. She mentions last week's hostage-taking of gas-facility workers by Islamist militants in Algeria. And she says the administration is dealing with this growing influence. "We have focused on targeting al Qaeda's syndicate of terror - closing safe havens, cutting off finances, countering extremist ideology, and slowing the flow of new recruits," Clinton said. "We continue to hunt the terrorists responsible for the attacks in Benghazi and are determined to bring them to justice." [Updated at 2:24 p.m. ET] More from Clinton's opening remarks: She points out that she appointed an independent review board - the Accountability Review Board, which you're sure to hear more about as this hearing goes on - to address what went wrong and how officials can fix it. "I have accepted every one of their recommendations - our deputy secretary for management and resources is leading a task force to ensure that all 29 of them are implemented quickly and completely ... as well as pursuing additional steps above and beyond those the board" recommended, she said. "We are taking a top-to-bottom look, and rethinking how we make decisions on where, when, and how our people operate in high threat areas, and how we respond." [Updated at 2:19 p.m. ET] From Clinton's opening remarks: "As I have said many times since September 11, I take responsibility." [Updated at 2:18 p.m. ET] Clinton is giving her prepared opening statement. It's pretty much the same as the opening statement she gave to the Senate panel this morning. Here it is. Keep in mind that the actual remarks won't be exactly the same as the prepared remarks. [Updated at 2:14 p.m. ET] Addressing the State Department's ability to provide proper security to its diplomatic missions, Engel adds that Congress had slashed resources, including requests for security funding. [Updated at 2:13 p.m. ET] The panel's ranking member, Rep. Eliot Engel, D-New York, is now giving his opening remarks. His tone, as we saw from Democrats during the Senate panel session earlier today, is less confrontational and more friendly than we've seen from Republicans. To wit: Engel said President Obama is no more responsible for the Benghazi attack than President George W. Bush was responsible for the September 11, 2001, terrorist attacks in Washington and New York. "Whether (the Benghazi incident) was called a terrorist attack or not in the immediate aftermath or not, as far as I'm concerned, is irrelevant," Engel said. [Updated at 2:07 p.m. ET] Royce, the panel's Republican chairman, continues his preface: Senior officials should have known about the security situation in Libya, he said. "Al Qaeda and its affiliates will very likely be targeting other diplomats for years to come," he said. The State Department "must get this right," he said. [Updated at 2:05 p.m. ET] The House hearing is getting under way, with the chairman, Rep. Edward Royce, R-California, kicking it off. Royce says he glad that Clinton is healthy and willing to testify before she leaves office. Royce, whose party has been critical of the State Department's handling of the Benghazi situation - including security issues before the attack and the department's reaction afterward - sets things up by saying that "threats to Americans abroad are growing - particularly those threats are growing in North Africa." [Initial post, 1:55 p.m. ET] For the second time today, U.S. Secretary of State Hillary Clinton is about to testify before a congressional panel about the September terrorist attack in Libya that killed the U.S. ambassador and three other Americans. Starting at 2 p.m. ET, Clinton will face the House Foreign Affairs Committee. This morning, Clinton gave what was at times fiery and emotional testimony before the Senate Foreign Relations Committee (you can get a rundown of that testimony here). Conservative Republicans on that panel challenged Clinton on the lack of security at the diplomatic compound in Benghazi, as well as the erroneous account provided four days later by U.N. Ambassador Susan Rice that the attack grew spontaneously from a protest over an anti-Islam film produced in the United States. Clinton was originally scheduled to testify last month but postponed her appearance as she was treated for illness, a concussion and a blood clot near her brain. The country's top diplomat returned to work just over two weeks ago. The comments today proved what the aged, senile Senate Republican senator and his mental midget Reps offer. They don,t want a Black President to succeed at any price. All of us voters be damned!!! This was nothing more than our "elected children" knowing that they were on TV! Repuks are total hypocrirts! They praised Clinton in their opening statements and then "let the attacks begin"! Paul is a disgrace! "If I were president you would have been releived"! Are you kidding me? It is to bad that we have a law that allows us to impeach the president, but you cannot do anything about these fanatics! You did not even have to watch TV to find out who was who! Democrats praised Clinton almost to the point of sainthood! Repuks, just the same old story. IF you work for Obama then you are wrong! What makes me the most angry is when they tried to make it out like it was because of that video. Funny how after the truth came out the video was hardly mentioned. Yes, there are problems with the federal system, but this is flagrant blame shifting by Hillary Rodham Clinton. The boss is always responsible and she is just blowing a smoke screen. This is the scheme the Clinton's have always relied on when they were in trouble. It wasn't Bill's immorality. It was the VAST RIGHT-WING CONSPIRACY!!! At the end of the day, Hillary is the irresponsible federal employee who needs to be fired. I'm amazed at the seemingly intelligent people posting here who just seem to want to tear down Secretary Clinton. To the majority, could you do the job? We are in a mess in America...people try to get us out, and we point blame for every mistake to someone else. Amazing...we sound like a bunch of toddlers. If this woman would let these Americans HANG OUT TO DIE, why would she not let other Americans to do so for her political careers? Anyone ever see the movie with Dustin Hoffman and Gena Davis "HERO"" where Gina Davis peels an onion? Hillary peeling the same onion!! No matter who cries, what about those families? Politicians are like actors, cry when needed, smile when needed, kiss the baby and wipe the lips when needed. We are ALL beneath them!! This will make a great movie in a couple of years. Give the information to Ben Affleck, George Clooney, Grant Heslov and Chris Terrio. These people will get to the bottom of this event and tell the entire story in 120 minutes and win awards in the process.